Take one woman with just the right mixture of wisdom and humor. Make sure she has had the experience of travel and working around the world and experiencing a variety of cultures. To this, add a love for words and a wonderful gift of telling a story. Then give her a warm heart, a deep yearning for peace and a great love for people. Stir on a slow fire (of passion) and what do you get? Galen Pearl – a woman I am happy to be associated with through our blogs. She has guest posted here and you, my dear readers are familiar with her already. Galen Pearl’s stories have appeared in Chicken Soup for the Soul and A Cup of Comfort anthologies, and her popular blog, 10 Steps to Finding Your Happy Place (and Staying There), attracts thousands of readers every month. Recently retired from teaching law, she regularly leads retreats and workshops on developing habits to grow a joyful spirit. A Southern girl transplanted to the Pacific Northwest, she enjoys her five kids and two grandchildren, martial arts, her cabin in the mountains, and mahjong. Today I’m so happy and proud to be able to review her book [amazon_link id=”B009JBBY6A” target=”_blank” ]10 Steps To Finding Your Happy Place (And Staying There)[/amazon_link]. When Galen Pearl mentioned that her book was ready, I was eager to read it. I’ve been reading her blog for the last three years and absolutely love her writing. It’s personal, conversational and packed with wisdom. I’m happy to report that her book is exactly the same. Although the outline of the book contains 10 Steps, the book is not meant to be a how-to guide to happiness. The premise of the book is that, deep within, we all want to be happy. However, happiness is truly an inside job – you’ve got to find your own happy place. 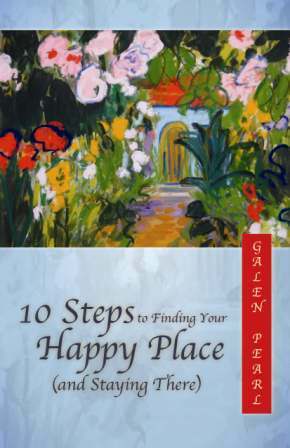 In Galen Pearl’s words from the introduction to the book: The title [amazon_link id=”B009JBBY6A” target=”_blank” ]10 Steps to Finding Your Happy Place (and Staying There)[/amazon_link] might sound like there is a way to happiness “out there,” and that we can follow the 10 Steps like we would follow the yellow brick road to Oz. But in truth, each of the steps brings us back to where we started, with ourselves. Like finding your your glasses on top of your head, you wake up and realize that your happiness was here all along. Galen Pearl has a great knack of telling stories. Her personal anecdotes just draw you in. The book has some great illustrative stories and quotes too. Galen Pearl draws inspiration from a variety of spiritual leaders and is very open to all religious teachings. Each little ‘story’ makes you reflect on the way you process your life experiences. It gives you much food for thought about what you are doing with your life. But never, ever is it preachy or condescending in its tone. I don’t want to outline the 10 steps here and give away anything from the book. Suffice to say that it is an excellent read and will leave you inspired to find (or stay in) your own happy place. I plan to re-read the book soon. I’ll read it slow this time and allow its depth to motivate and inspire me more. May I suggest you find your happy place too and stay there. Let Galen Pearl’s book help you along. Wonderful review, Corinne. I have been visiting Galen’s blog and and off and every time leave it feeling inspired. Galen’s blog is really very inspiring and wonderful. I enjoy reading her posts and it feels simply great to see her book. The cover page is really eye catching and beautifully done. Liked your review of not revealing the 10 steps.. will try to grab a copy soon! I think Galen’s sister did the cover page. Do get a copy – you’ll truly enjoy it, Privy. Yes, that is my sister’s painting on the cover and she did the design for the cover, too. I’m so lucky to have such a talented sister! I’m so happy to have learned more from Galen Pearl and her book. I just wish I could take in more. I guess I need to continually give space to more inspiring people like her. Melissa, you’ll love Galen’s blog and her book is the kind that you can read slowly – like one reflection a day – ideally. Thanks corinne for sharing ! and congrats Galen for the book, the cover page is beautiful. I am happy to read your blogs and you are inspiring, would love to own it. Thanks again ! You’re welcome, Janet. Galen’s writing is very powerful and inspiring. I’m not sure whether the book is available in India yet. It should be available on Amazon UK. If you find out that it is not available in India, please let me know so that I can follow up on that. Thanks! Corinne, Thank you for a lovely and gracious review. I am humbled by your kind words. And by the kind words and good wishes of your commenters. I agree with you that your readers are a special group of inspiring writers, and I’m pleased to be counted among them. Note, the Kindle version is now available. And to Linda, the Everyday Gyaan-ness is brilliant. Corinne, you can expect to hear that repeated often! Many, many thanks. You’re very welcome, Galen. You know how much I appreciate you as a person and love your writing. The book really is a keeper – I’m going to be re-reading it again soon. One more book to my reading list…hope to borrow it from you. It will be available soon on Kindle, Shilpa. Meanwhile do visit Galen’s blog. The 2011-12 edition of the Directory of Best Indian Blogs has been updated, and your blog finds a place in the Directory. We don’t know how much you care for this listing, but we assure you that we work hard to select blogs for the Directory. Our hearty congratulations on your maintaining a blog, and we wish that your blog reaches new heights. If you feel we’re doing a good job, why not suggest a few good quality blogs writtin by Indians or those written by foreigners on India? We are posting this message here as we could not find your email ID on the blog. Or did we miss it? The form did not open either. Congratulations on the publication of your book! The cover is truly lovely and exudes the spirit of happiness! Such a positive review by The Everyday Gyaaan-ness is a feather in your cap! Sounds like a delightfully, inspiring read! Great review Corinne. Galen is truly a wonderful writer. Her blog is full of inspiration and truth. And who can’t use a little happiness in their life? It sounds like the book is a ‘must read’, so I’ll be sure to get a copy. Thanks, Myrna. You’re absolutely right about Galen’s writing. I think of Galen and you as having the same openness to spirituality and an ability to touch people deeply. So glad to be connected to both of you. Wonderful review Corinne, and who doesn’t know Galen! She is an awesome blogger and I love visiting her blog as well. Yes, I’ve been reading so many blogs that have put up posts about her wonderful book, and just wish I had that kind of time to sit and go through it as well. But the words of appreciation coming from you seem like it’s something to be read for sure. Thanks, Harleena. Yes, Galen is so popular with her writing and her thoughtful and insightful comments too. You know what, this book is best read slowly, so it might just suit you. It’s a keeper for sure! Great review, Corinne! Galer is one of my favorite bloggers, too, and I know her book is as wonderful as you say here. Hope to get a copy soon!